In my pre-teen through teen years, one could not get me to leave the house on a Sunday for anything - no trip to Six Flags, rock concert or house fire would be enough to convince me to ignore that week's NASCAR Winston Cup action. However, a lot has changed since then - I've long-since picked baseball as my no. 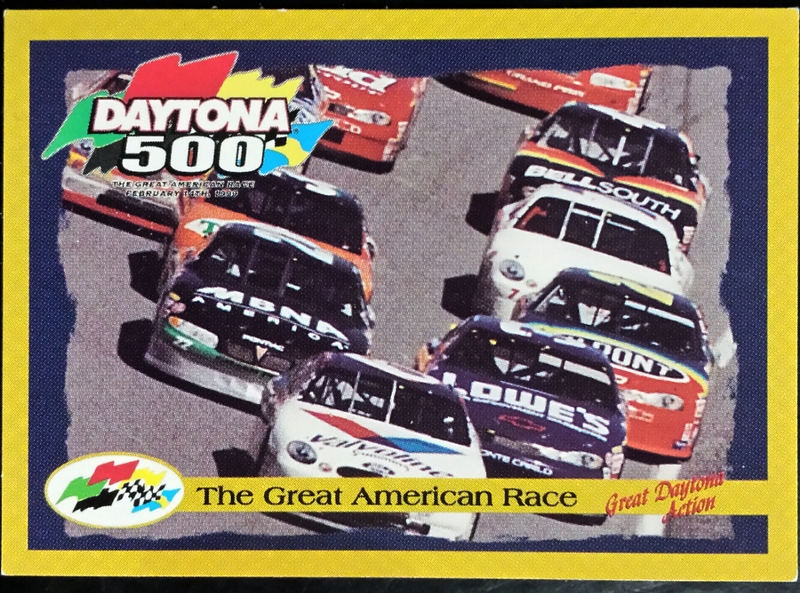 1 sport and very little about stock car racing's top circuit bears a resemblance to those tobacco sponsorship days. That said, there are still two auto racing events that are nonnegotiable, appointment television to me - the Indianapolis 500 and Daytona 500, two of the biggest sporting events in this country. I might not watch week in and week out like I used to, but the pageantry and prestige of winning the 500 Mile Sweepstakes or the Great American Race still keeps me tuned in for each year's running. Now, since it's clearly not May - although, the temperatures out here in Chicago this weekend would justify that confusion - we can thereby deduce that I'm bringing all of this up in preparation for the Daytona race, the 58th running of which will be held tomorrow. 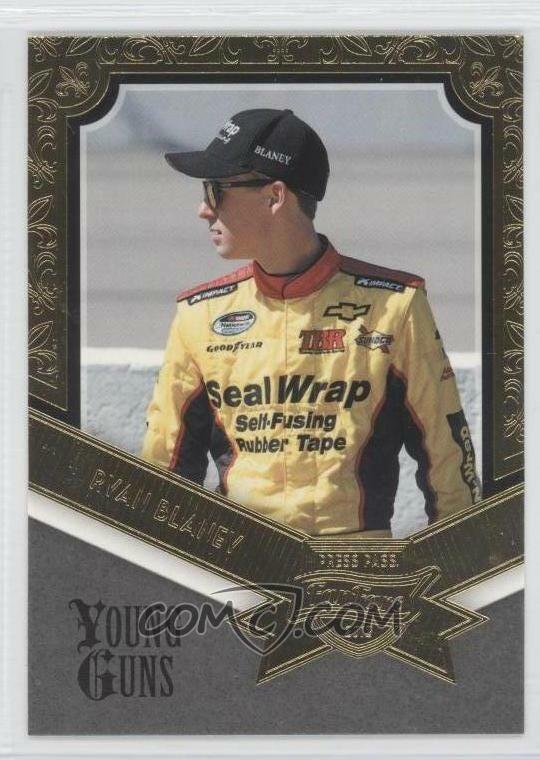 Since, my fervent fandom died down long before pole-sitter Chase Elliot arrived on the scene, I don't have any cards of the guy. Throughout the course of this exercise, this will be a persistent problem; so, many thanks to COMC for filling the gaps here. Meanwhile, sitting with Elliott on the front row is a guy I'm much more familiar with - Matt Kenseth. 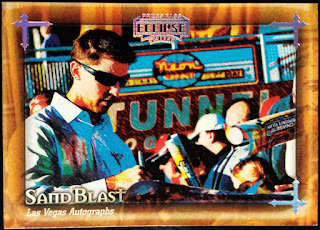 In fact, I've had the privilege of meeting the guy twice, as evidenced by the John Hancock on that Upper Deck Sneak Peak single from 2000. 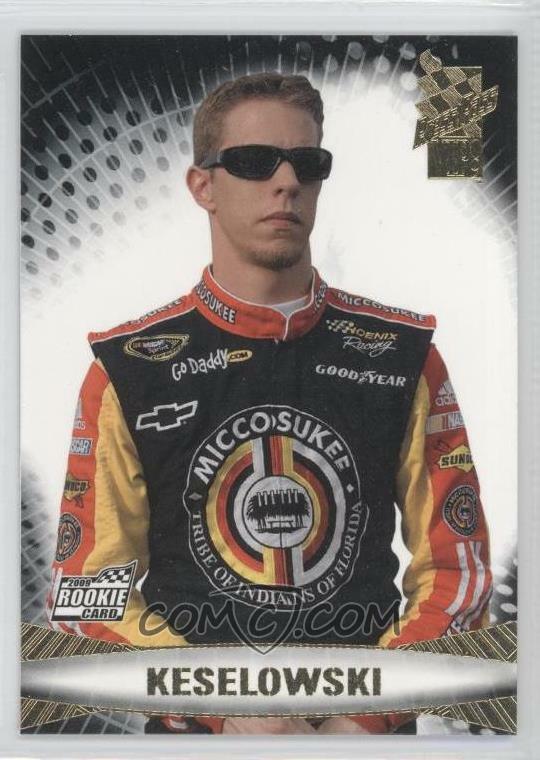 Here we have the perennial overall favorite of the NASCAR fan-base, back when he was just a young punk with his bleached hair and such. 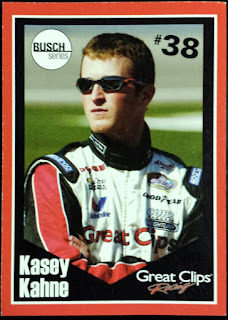 Next to him is another guy who's still known for being a punk, despite being a grizzled veteran, in Kyle "Rowdy" Busch. 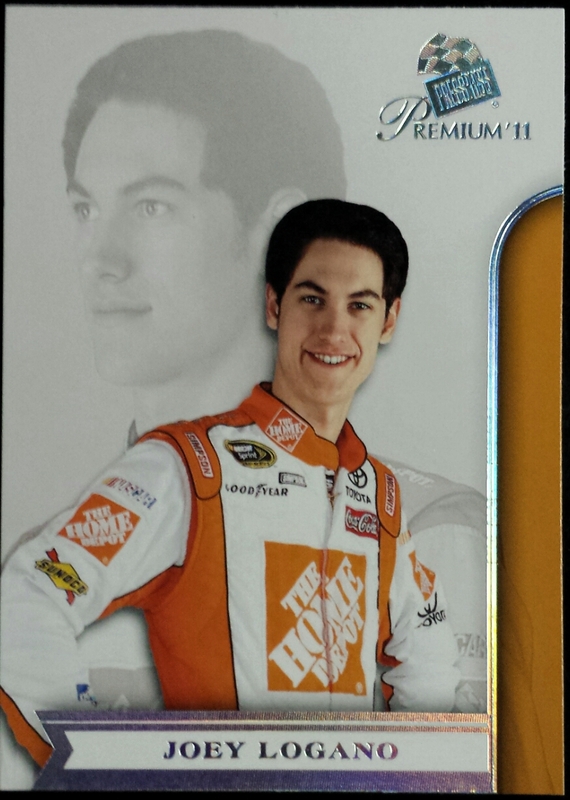 The defending champion of the race in Joey Logano. Fun fact, Logano doesn't actually need to wear a helmet while speeding around the tri-oval at 200+ mph; his hair-helmet is more than capable of protecting his noggin. 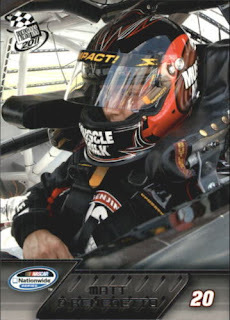 Jamie McMurray won his first Cup race in only his second attempt (2002), a modern day record; but, has only won 6 more times in the 472 contests his competed in since then (one of which being the 2010 edition of the Daytona 500). 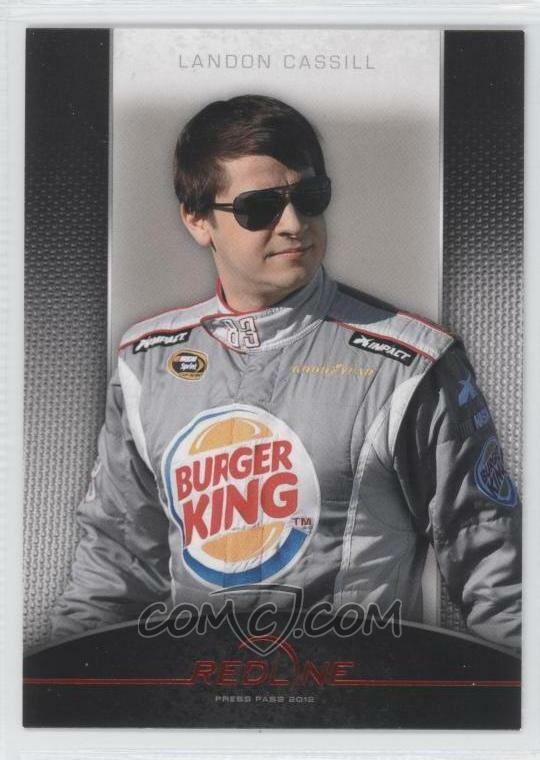 Here we have another son of a guy I used to root for in Ryan Blaney, son of Dave. Alongside side of him is Kyle's brother Kurt Busch, who is a fervent Cubs fan. So, I find it hard to ever root against the guy. 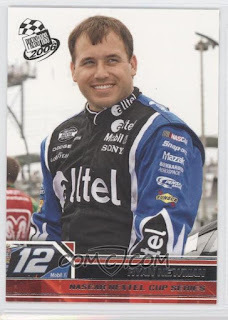 Perhaps this will be the year he can add the Harley J. Earl trophy to his case, alongside his 2004 Nextel Cup title. The guy who will forever be cursed by not being as good as the legendary Dale Earnhardt. Despite recording 31 wins, a ROY title, a Sprint Cup Championship and a Daytona win, he'll never measure up in the eyes of many a stubborn fan, since he was the immediate successor when Earnhardt was killed in 2001. There's a Carl Edwards on the Cubs and there's a Carl Edwards in NASCAR. 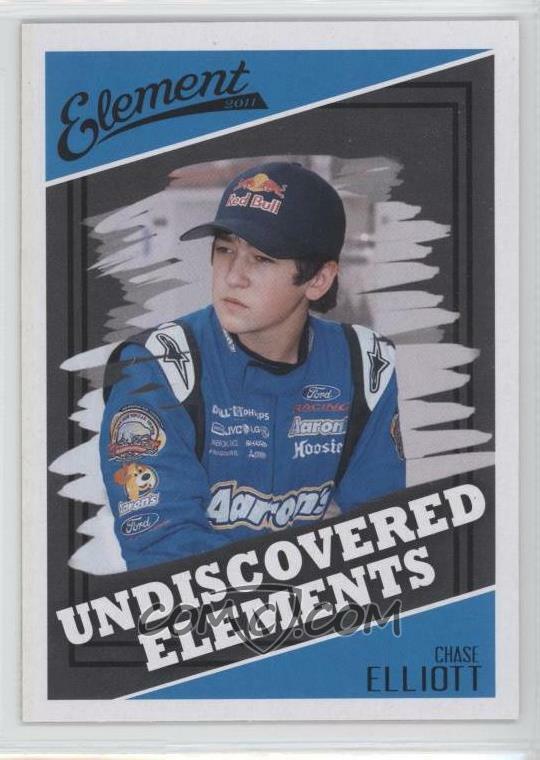 This one is most known his acrobatic antics whenever he wins a race, performing a back-flip off of the roof of his car whenever he's first across the line. I can never root against seeing that. 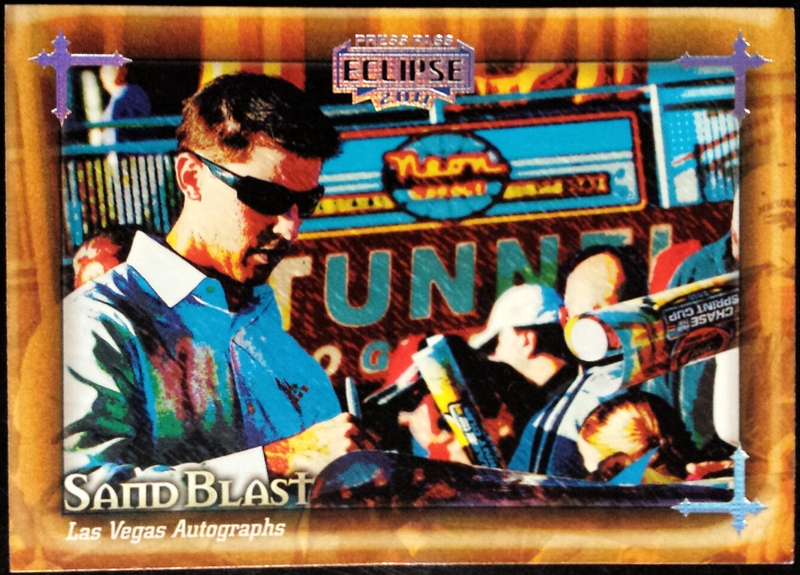 That's Denny Hamlin, artistically signing autographs on the right. Starting next to him will be ANOTHER guy whose dad was racing when I was an avid NASCAR fan. 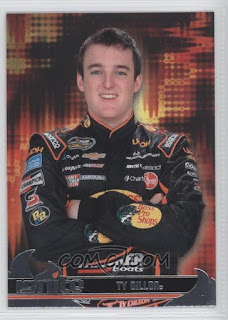 Ty Dillon's father Mike was a competitor in NASCAR's second rung for several years. Stop making me feel old today! The Kasey Kahne oddball to the right might be my favorite racing card that didn't get purged when I was a shortsighted college student. 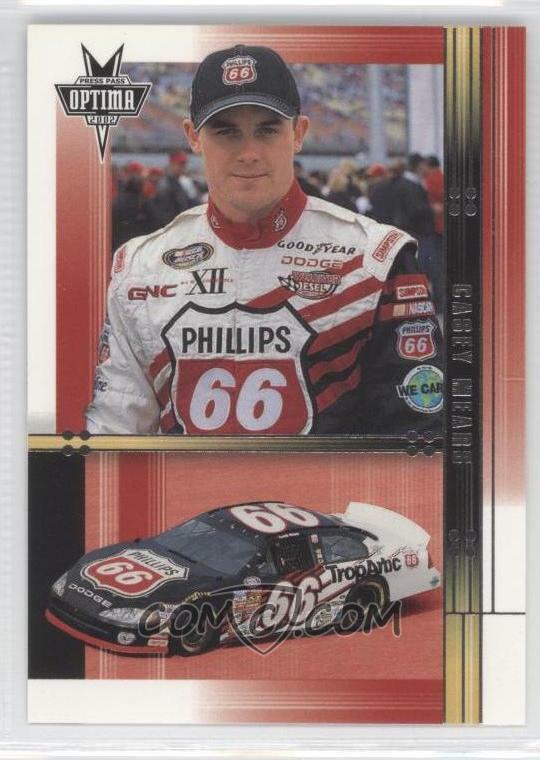 This pre-rookie Kahne (my second favorite "Kahne" in sports) was a give away at Great Clips back when they sponsored Kahne in NASCAR's equivalent of AAA. 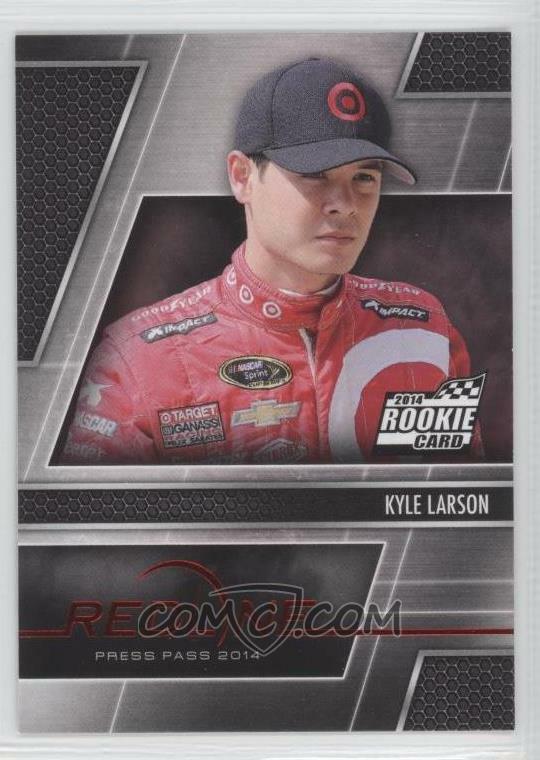 Kyle Larson is a guy who I know nothing about and, obviously, has no cardboard presence in my collection. 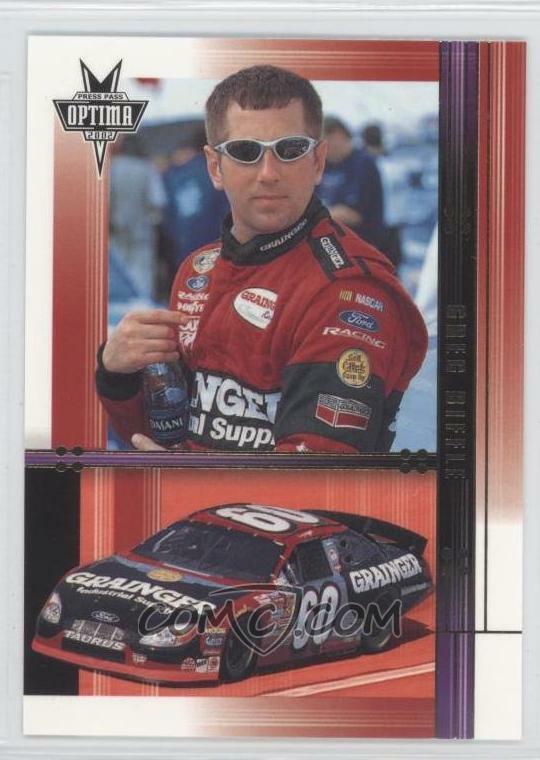 I am honestly shocked that I didn't have a Greg Biffle in my collection - after all, he started competing right in the midst of my peak fandom years. I have a sneaking suspicion that his cards didn't survive that purge I alluded to earlier - this card looks unsettlingly familiar. Danica gets a lot of flack for her results not living up to her notoriety. However, I've been following her career since she was a rookie at the Indy 500 in 2005 and, thus, have a bit of a soft spot for her. Plus, it'd be awesome to see such a traditionally conservative sport upended by a triumphant woman. Here's hoping that 2016 is the year she puts it all together. 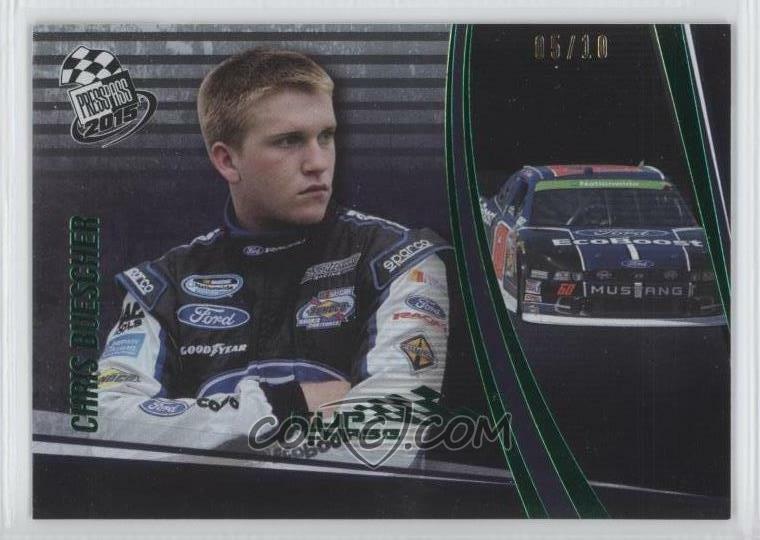 Chris Buescher won the championship in the Xfinity Series last season and will make the full-time jump to NASCAR's premier circuit this year. 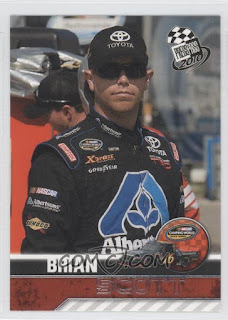 All that being known, he's most notable to me for maybe accidentally breaking the news that a card company has finally picked up the NASCAR license, which has been dormant since Press Pass bit the bullet. Vickers, like Biffle, is another guy I should really have in my NASCAR binder already. 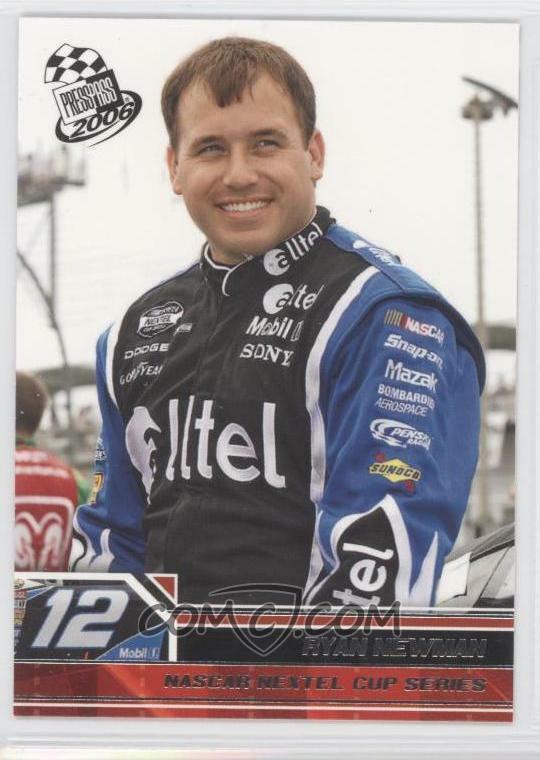 On the other hand, he probably wouldn't have even been in this race if Tony Stewart didn't severely injure his back in an ATV accident. As such, my original favorite driver (namesake and all) will miss his last chance to win the sport's premiere race. seeing as he's already announced 2016 will be his last go-round. Two more guys who I really know nothing about and, accordingly, have no cards of. The Stenhouse card comes from COMC and the DiBenedetto was swiped from Ebay, since even COMC doesn't have any cardboard for the obviously Italinan-American dude. Ty out-qualified his brother Austin by quite a bit, as you can see. 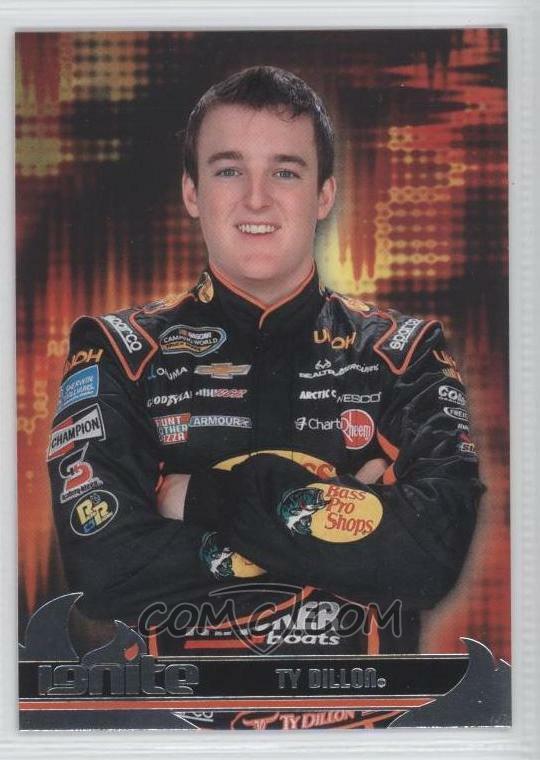 The only reason I'm previously familiar with Austin is because of the feathers that were ruffled when it was announced he'd be piloting the sacred #3 when he entered the series full-time. That sacred number hadn't been used since Earnhardt's death and a large faction of the fan-base felt that it should stay retired. The way I see it, a number is a number and who gives a crap? 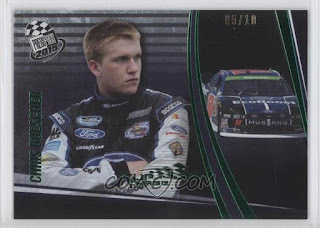 Bayne is still the youngest man to win the Daytona 500 (20 years old in 2011) and one of a handful to win the contest in their first attempt. 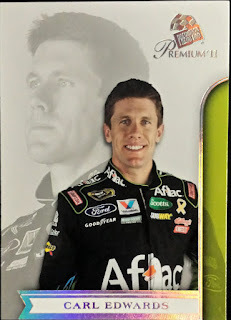 I'll be rooting for him because he now pilots the #6 Advocare Ford Fusion and my fiance and I are big-time proponents of Advocare. Their products have helped me personally lose 20 pounds gained during my post-college, running lethargic period. Landon Cassill is another one of those names that I'm not familiar with; however, the team he's driving for is one that I am. 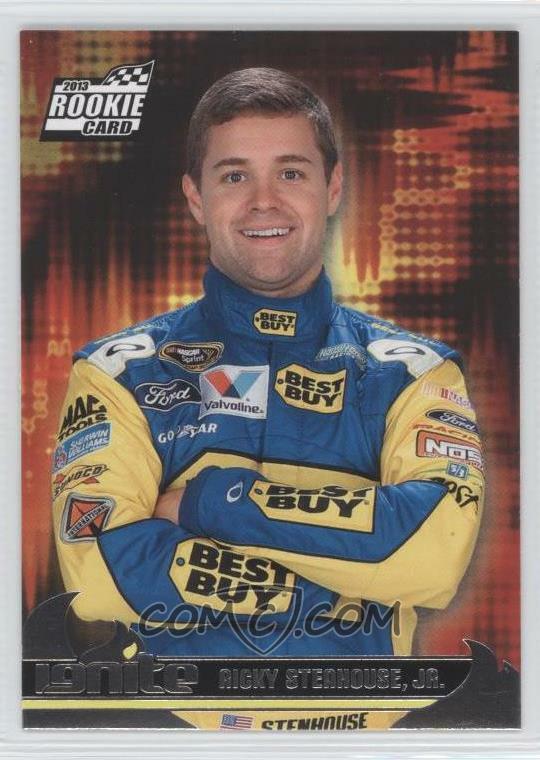 Front Row Motorsports was one of those independent, barely staying afloat and lucky to even qualify teams that was field-filling way back when. The fact that they've managed to stick around and even gain major corporate sponsorship is pretty nifty to see. Brad Keselowski was just emerging as I was backing away from NASCAR. 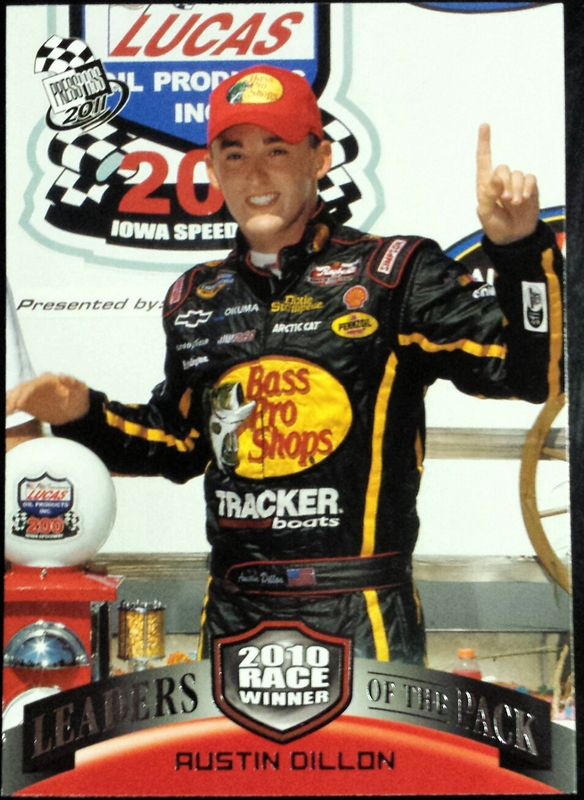 I should probably have a card of the 2012 circuit champion... but, I don't. 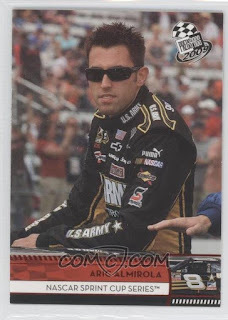 Meanwhile, the greatest NASCAR driver of all-time (yeah, I said it) is sitting rather far back in the field. One can never count this guy out, though. 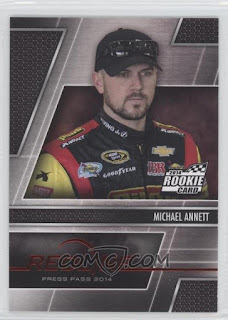 Here we find Regan Smith and Martin Truex, Jr. Two guys who are liable to sneak up and bite at any time, but just aren't consistent enough to be real threats. 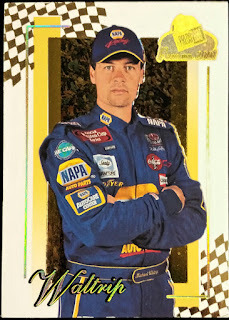 Sidenote - I've always had a thing for the blue and yellow NAPA cars. Something about those two colors together really does it for me. 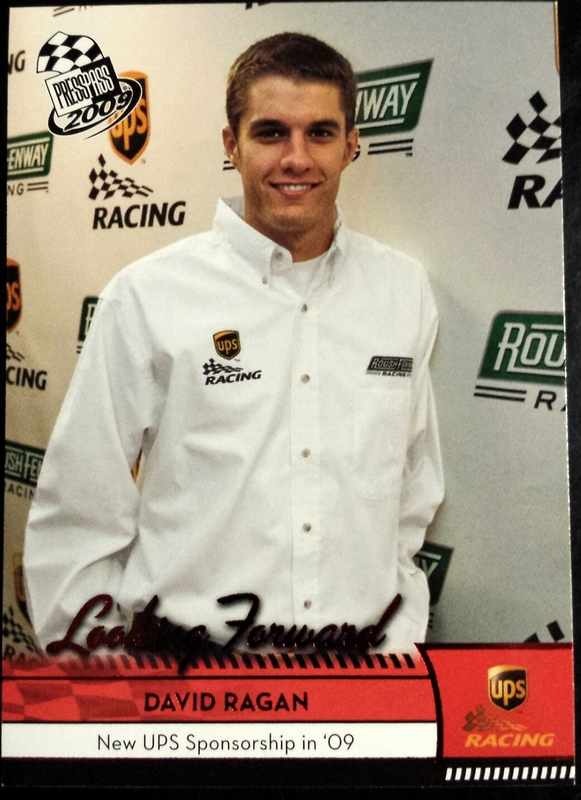 Last time I checked in, David Ragan was actually getting parked by NASCAR for being the cause of so many wrecks - not that he was purposely crashing others, he just didn't seem to have completely grasped controlling a Sprint Cup car. He must have turned things around though, since he's still around now. 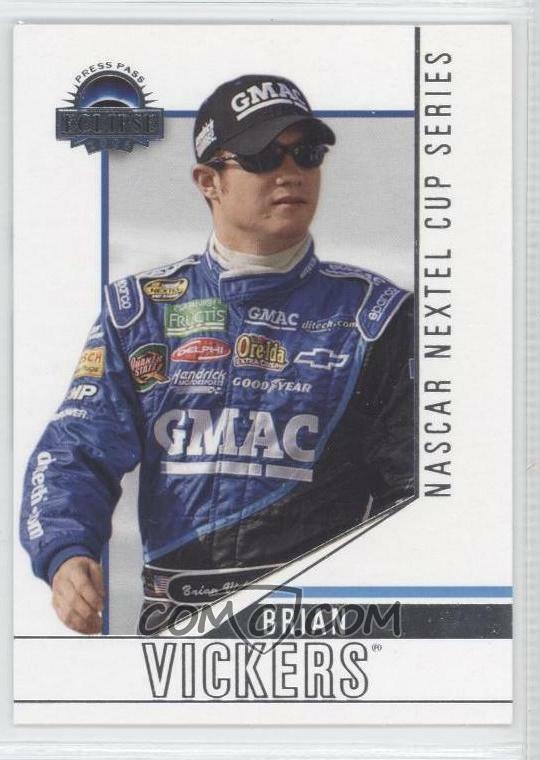 Allmendinger has been back in NASCAR for a couple of years now since having been banished back to the open wheel ranks (where he got his start) after testing positive for amphetamines. Seeing as I've been regularly attending Indy 500 festivities since 2003, I always root for the open-wheelers who make the jump. 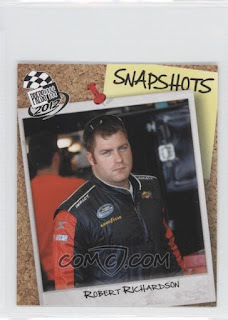 Gotta love that hasty Photoshop job to get the Jack Daniels imagery off of that Clint Bowyer card. If NASCAR cards were being produced now, he wouldn't have that problem since he's now sponsored by 5 Hour Energy, even though those drinks are probably worse for your health than a shot of whiskey. While initially reviewing the starting grid, I audibly exclaimed, "Bobby Labonte is still competing?" 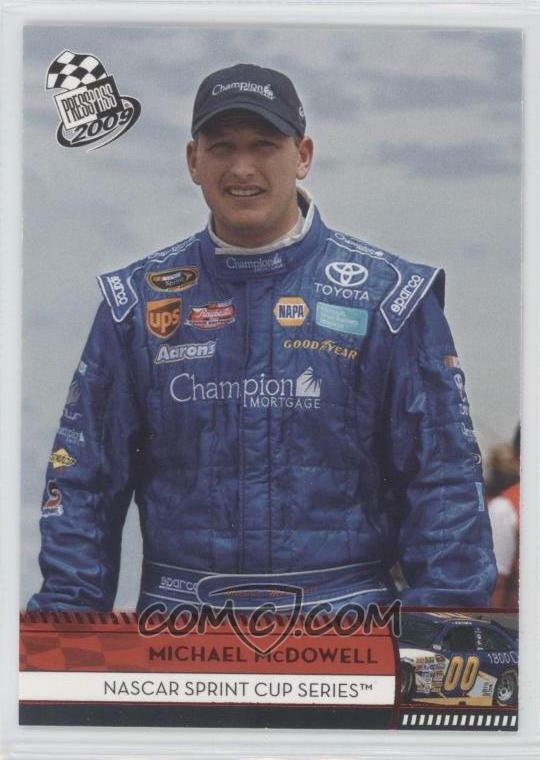 I was genuinely surprised, as the 2000 series champion was on the downslope when I was first losing interest in the sport. Looking at his results, "competing" might be a strong word for the 51-year old, since he hasn't entered victory lane since 2003 (!!). 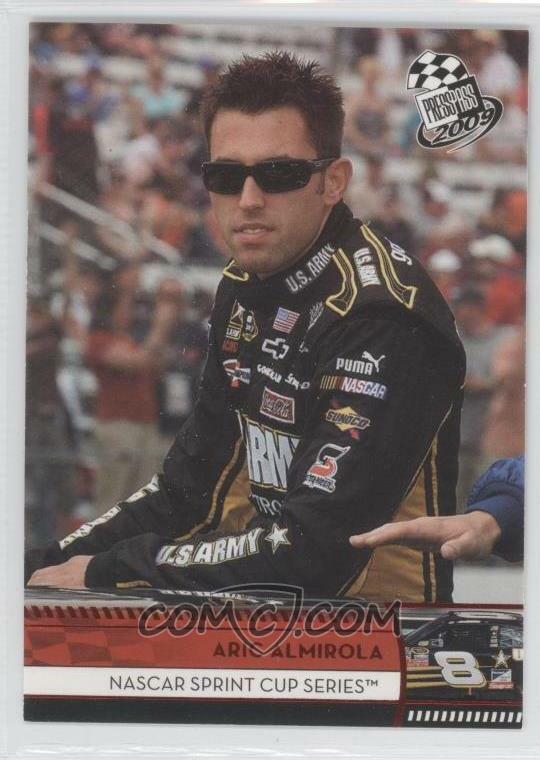 Almirola is another name I vaguely recognize, but know nothing about. I'm being told that Brian Scott is indeed a NASCAR driver and not a fusion of AC/DC's legendary lead singers Bon Scott and Brian Johnson. Coulda fooled me. Michael Waltrip is another guy I was genuinely astounded to see is still racing in 2016. 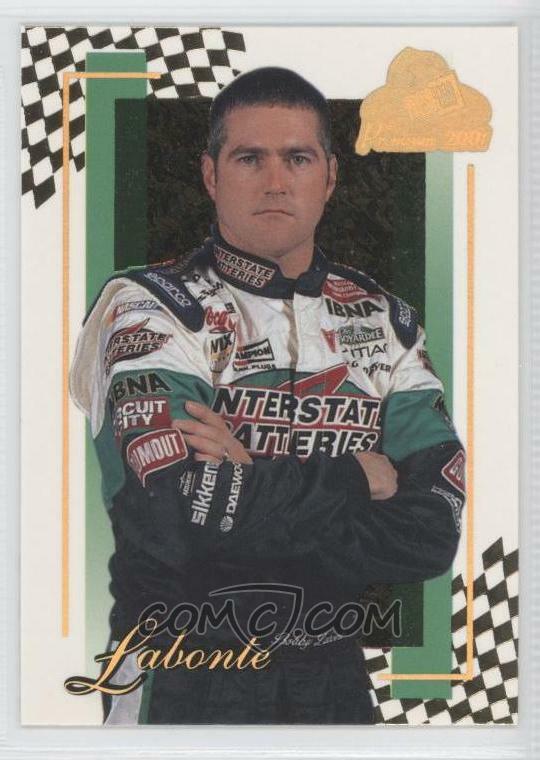 He's one year older than Labonte and 2003 was also the last year he saw victory lane. However, he's one of NASCAR's greatest underdog stories of all-time; so, maybe he has one more great surprise left in him. Paul Menard is a guy that I suspect only gets by because of his last name. If he wasn't a member of the same family that owns hardware and home improvement giant Menards, I don't think he'd keep getting big-time rides and his built-in sponsorship would be non-existent. He's been in the Cup series since 2007 and despite driving for such storied teams as Dale Earnhardt Inc., Yates Racing, Richard Petty Motorsports and Richard Childress Racing, he's won a grand total of once. 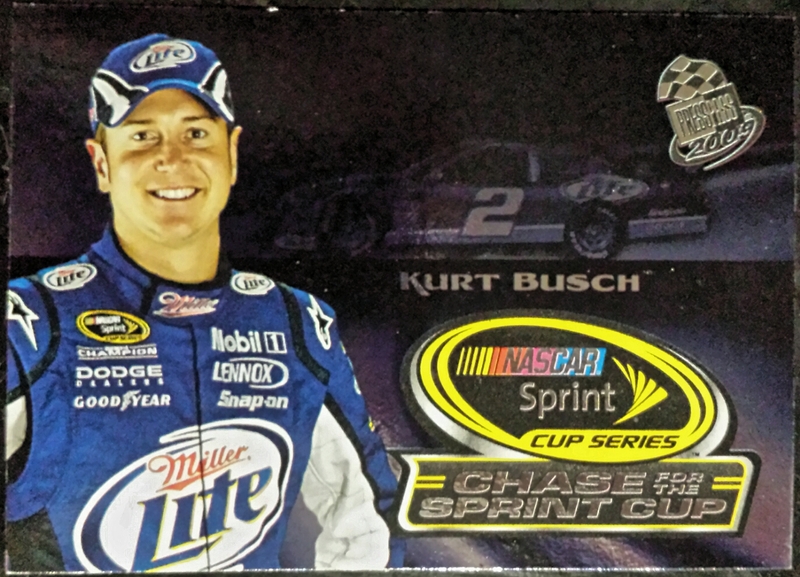 For that matter, he won only one race while coming up in the development series(s). *Sigh*, like Labonte, Mears, Vickers, etc., "Flyin' Ryan" joins the list of big-names who didn't survive my NASCAR card extermination attempt. Even though the wall buckled like a belt and the card basically disintegrated, all of that was actually a good thing, since that means all the energy from the impacts were dissipated. McDowell walked away like nothing happened. Oh - Robert Richardson... apparently he's a NASCAR driver too. There you have it - the full starting grid for tomorrow's running for the Daytona 500. I'm looking forward to what will hopefully be an exciting show of speed and competition on the highest level. Do any NASCAR fans who are reading this have any predictions for what may happen? Who do you think will take home the trophy this year? I'm going to put my money on Dale Earnhardt, Jr., since he's always been a natural when it comes to restrictor plate racing. After this, I'll likely tune out of motorsports again until the May running of the Indianapolis 500, in favor of Cubs baseball. So, make this one count guys! 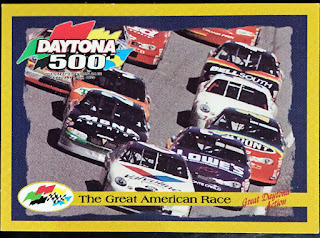 I paid attention to NASCAR in the 1980s and a little into the 1990s...and then again whenever I end up with a race on TV (which doesn't happen any more, really). That said, the little town outside of Milwaukee where I grew up is called Slinger. 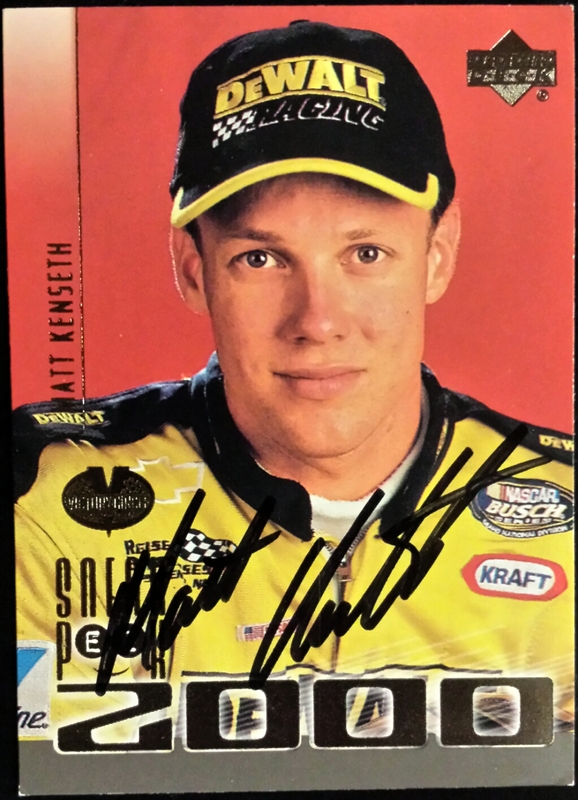 Matt Kenseth is a local boy there -- he was track champion there back 25 years ago as a teen/early 20s guy. He was called "Matt The Brat" then. I'm not a big NASCAR person but I will watch if nothing else is on. I'll tune in to Daytona and the Indy 500 but that's about it. 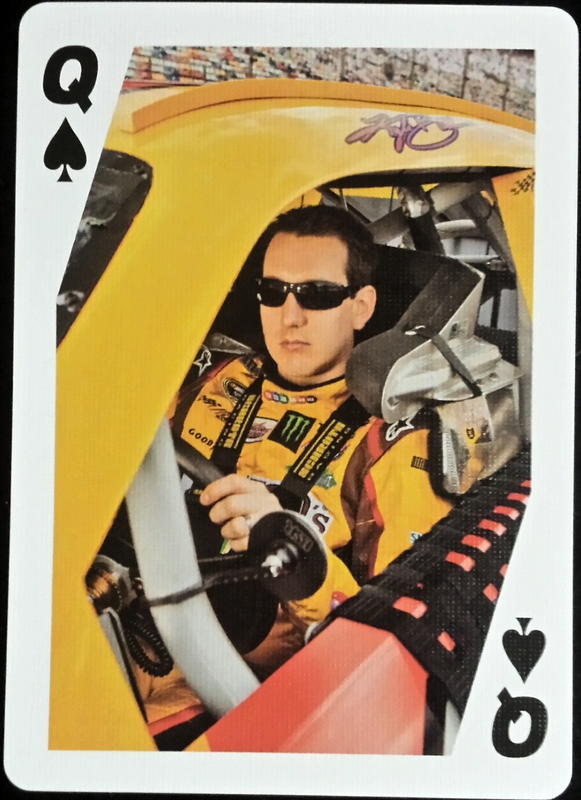 If challenged, I couldn't name more than 10 active drivers. 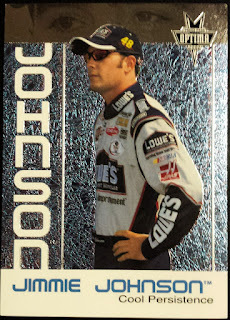 I was a big NASCAR fan in the 1990's, but now NASCAR is like that crazy ex-girlfriend who you are still have some feelings for, but you just can't be around her anymore, and you start to wonder if she'd changed, or she was always crazy and it just took you a while to see it, but now that you've seen it you can't unsee it. 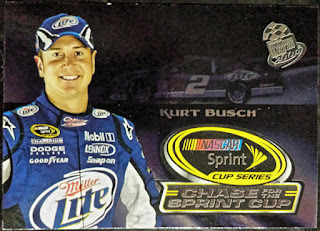 Where the heck is Rusty Wallace and those cool Genuine Draft commercials? When he comes back... I'll come back. Actually... 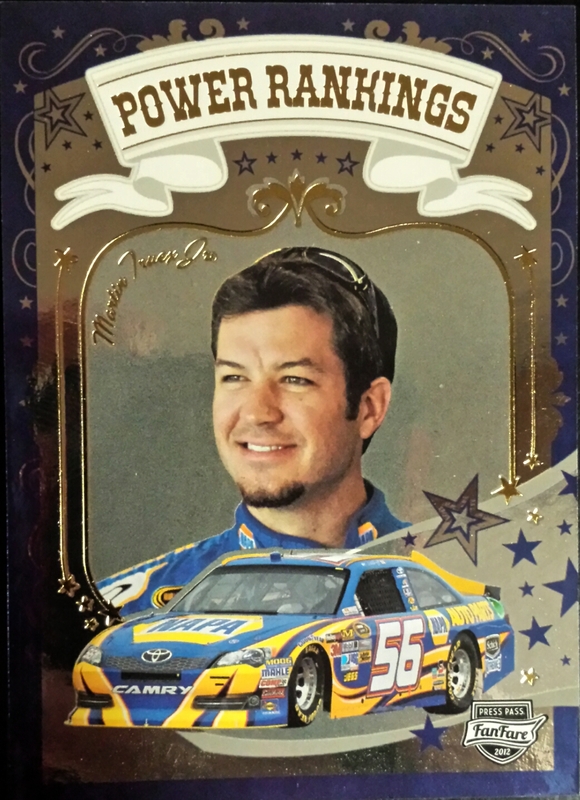 I've never really been a serious fan... but since I collect cards, I have some NASCAR trading cards laying around somewhere. I guess you could call me a poser fan.